6-foot-six 225 pound tight end Bentley Hanshaw verbally committed to play for BYU at the end of June, the 10th commit for the Class of 2017. Hanshaw played football and basketball at Moorpark High School (CA), the same school that produced BYU great Dennis Pitta, now in the NFL with the Baltimore Ravens. Hanshaw is rated 3-stars by Scout and Rivals, and ESPN. Scout rate him as the No. 19 tight end in the west. He received scholarship offers from Air Force, BYU, Cal, Hawaii, Navy, Nevada, New Mexico, Oregon State, San Diego State, San Jose State, Utah, Utah State, and Wyoming. He also saw recruiting interest from Arizona State, Pittsburgh, and UCLA. Bentley’s father Tim played on the offensive line for BYU before his NFL career with the San Francisco 49ers, and Bentley is close friends with other c/o ’17 commits: Moorpark teammate Tanner Baker, and Isaac Rex. Class: 2017 HT/WT: 6’6”, 225 lbs. Profiles: MaxPreps, HUDL Bench/Squat: 275/405 lbs. BYU Insider: Why did you choose BYU? (aside from the family connection) and why is BYU a good fit for you? 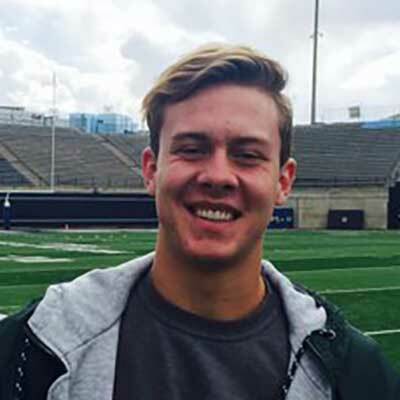 Hanshaw: I chose Byu because I love the whole vibe of the place, and I like what Ty wants to do with the tight end position. It’s is a good fit for me because of my religious background and the new pro-style offense that utilizes the tight end. Hanshaw: I look forward to representing my family name and playing on top tier ESPN games. Hanshaw: Some of my favorite movies are Remember the Titans and Inception, and I love the show Friends. I love almost all music except hard rock. I listen to rap, country, r&b etc. Hanshaw: In sports, probably getting my first scholarship offer. In life, I don’t think I’ve done too much yet… but probably just being a good example for my younger brother. Bentley Hanshaw is a verbal commit for the BYU Class of 2017. For a comprehensive list of all of BYU’s c/o ’17 recruits and commitments click here. If you have any additional information or insight about this recruit, please include it in the comment section below.